Australia’s Defence Force is subject to tough and extreme conditions, and RUD lashing systems are designed to combat just that. When your trucks go out on the road, when you deliver heavy equipment to a building site and when you transport for a living, you need to think about load restraint. It’s a detail, but a costly detail to get wrong. Get your load restraints wrong and you can face fines, or worse. It’s simply not a place to compromise. You need a purpose-built load restraint system from a company that strives for dynamic innovation, yet still offers traditional qualities like reliability and simplicity. You also want a partner who is fully certified with ISO, NATA and LEEA accreditation, so you know that their systems have gone through every possible test. 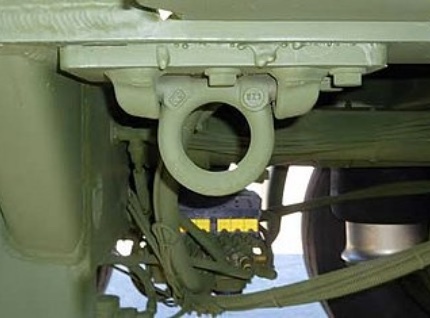 RUD Chains Australia provides tie-downs and mission critical gear to the Australian Defence Force, including snow chains, tyre protection chains, secure lifting devices and heavy vehicle hoists for our local defence fleet. A subsidiary of RUD Chain in Germany, globally we also provide key defence solutions for NATO and overseas Defence Forces around the world. Reliability that cannot be compromised. Our systems have been used to tie down tanks and aeroplanes in very extreme weather conditions and are trusted to maintain their strength and security. RUD provides first-rate systems equipped on land, sea and air in accordance with the latest Australian, International and Defence force standards. RUD is committed to ensuring we produce the highest quality equipment that complies with recognised global and Australian standards and Defence Force demands, including NATA, ISO and LEEA. RUD Chains focuses on the materials, producing chains that are lightweight, but can handle any loads in the most strenuous of circumstances can throw at them. It’s a system that spreads the load between chains and it can be tailored for specific problems or transport issues. The system is intuitive, thanks to integrated pretension indicators, and it has been designed from the ground-up with simplicity in mind. RUD has more than 140 years of experience in the industrial space. What started out as a small German family business has now turned into a global company with a presence in more than 120 countries. The Australian arm is based in Brisbane, in a 6000m2 facility that houses Engineering Services and Manufacturing. Customers range from local SME’s right through to large multinational Defence Primes. They all get the same dedicated customer care and the solutions they need. Legislation is getting tougher all the time, especially with the Chain of Responsibility that was recently introduced to the Australian transport industry. The simplest way to stay ahead of the curve is to invest in lashings and tie-downs that are used extensively Australian Defence Forces Army, Navy and Air. To find out more about RUD Chains and how they can lash your equipment down safely for years to come, get in touch.